Use an electric pressure cooker, an Instant Pot or any other, to cook beans easily and quickly! This is one of those really exciting recipes! The first thing I’m going to tell you is that it can be even simpler… I give you a few optional steps – soaking and draining. You can skip them, if that works for you. But if anyone you cook for ever has what are coyly referred to as digestive difficulties with beans, the soaking may mitigate them or even prevent them all together. (It prevents it for me. TMI?) I also do think that soaked beans cook more evenly, especially if you ever get an older batch of beans… but that’s more an impression than something I can point to as fact. Too many variables. The pot in pot method keeps the gloppy starchy liquid in the internal pot, while pure water boils merrily away making steam in the actual pressure cooker pot. You don’t get the mess, the regulator doesn’t get clogged, and the whole process is much easier. I talk about this in the Pressure Cooker Brown Rice recipe – I found a stainless steel pot that fits perfectly in my Cuisinart. If you look online, people have suggestions for inserts for various brands – and of course, you may already have a steel or heat safe ceramic bowl that will work. 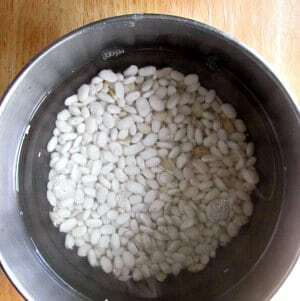 Six to eight hours – or more – before you plan to cook them take a pound of dried beans, Pick over them carefully – yes, I have found pebbles in beans, and you don’t want to bite on one. Also remove any that look moldy or discolored. Rinse them well. Put them in a bowl (I just use the one I’ll use to cook them in) and cover the beans with water. the amount will vary some by the configuration of your bowl – I usually put enough to cover about an inch. Classic directions tell you to soak overnight – which is fine if you plan to cook beans in the morning (and I sometimes do.) 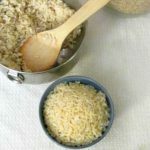 But really, most of us are more apt to cook them in the evening – or late afternoon on a weekend – in which case putting them to soak first thing in the morning makes more sense. If you have soaked them, drain the soaking water. If you skipped that step, now is the time to pick over and rinse, as described above. Put the beans in the pot in pot, and put it in the insert pot in your pressure cooker. (I have to be careful with terminology, here – I think of my extra pot as the “insert pot” but the removable pot in electric pressure cookers is often referred to that way, because you insert it into the appliance.) 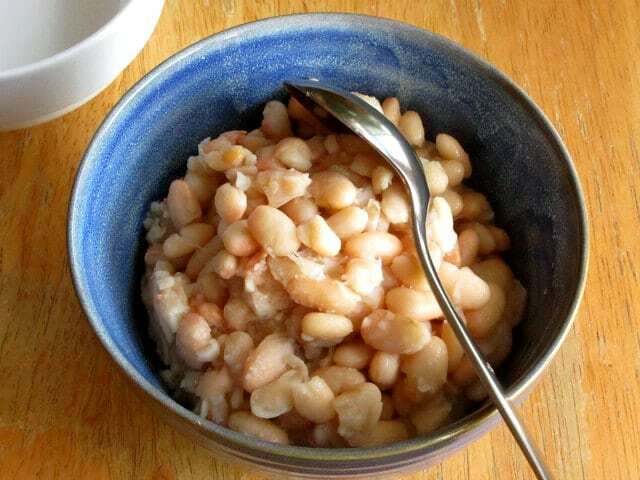 Pour water in your bowl to cover the beans – if they have soaked, you just need a half inch or so. If not, of course you need more – I’d give them a good inch and a half. And pour half a cup of water outside your bowl into the insert pot – that’s what will boil and give you steam to raise the pressure. Close your pot and set your pressure valve. Now – set it to High. Timing will vary by the kind of bean – I’ve done small soaked pea beans in forty five minutes, but I usually give (soaked) chickpeas fifty five or even an hour. 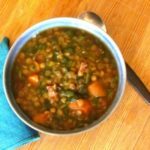 (Lentils will cook in fifteen minutes, but I rarely even bother with the pressure cooker for plain lentils – as long as I’m at it, I usually make soup or whatever.) You can vary by a few minutes by how soft you want them, as well. I gave black beans fifty five minutes the other day, but I then pureed them for soup – I’d do fifty if I wanted them firm and individual for, say, salad. All right, one of these days I need to make up a chart for you… I need to take better notes, though, first! But anyhow – set it, hit Start, and let it happily cook without your attention! It’s one of those tasks that sounds more complicated than it is, once you’ve done it a few times… I just check my menu plans after dinner every night, and (since I’m around in the morning) if I’m going to want beans I soak them. In the morning I cook them and they’re ready to make soup by lunchtime! And then use them in a recipe that is more exciting! Creamy Tomato and Navy Bean Soup, for instance (if you want something fast and easy) or Blizzard Beans (if you have time and feel like playing…) Beans are an empty canvas – you can do almost anything with them! 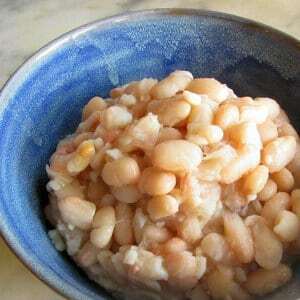 Put beans in a pot you can use in your electric pressure cooker. Place that, on a rack if needed, in the insert pot in your cooker. Add enough water to cover - with about half an inch more if soaked, an inch and a half if not. Add half a cup of water in the insert pot of the cooker. Cover and set the valve. Set the pressure to High. Set the timer to 50 minutes for soaked beans, 60 for dry. Start. When cooked, allow pressure to release naturally. This is the timing that works for me for Great Northern Beans. You will want to vary by the type of bean - less for smaller ones (such as black beans,) longer for larger or harder ones (such as kidney beans or chickpeas.) The technique, however, remains the same. Note the optional step of pre-soaking, which will add time to the prep (though you don't have to be there) and subtract time from the cooking time. Great post! I recently got an Instant Pot, and the thing I've been loving it most for is cooking dried beans. It really does cut down on the time and the texture of the pressure-cooked beans is great! 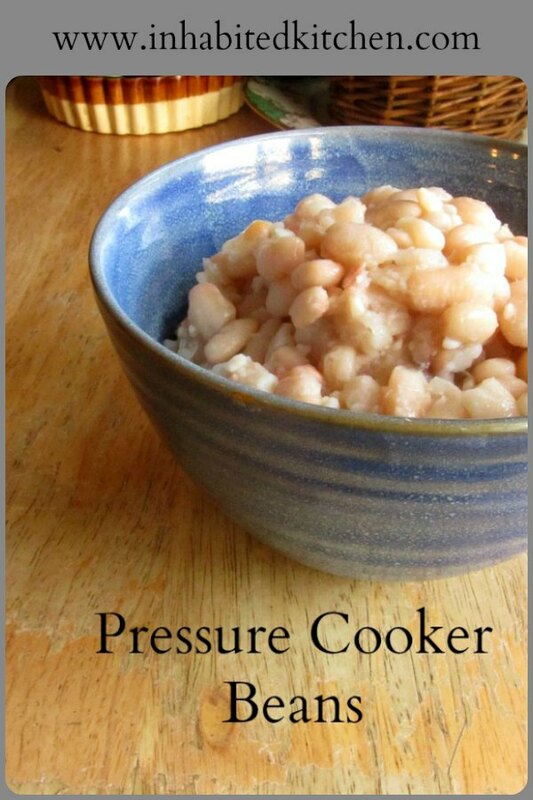 I use my electric pressure cooker for beans and brown rice on a regular basis. Other things, too - I have chicken stock in it right now, and I do make actual dinner recipes, but those are my staples. And thank you! I call for beans in so many recipes, I like to make sure people know all the options, from canned to this! These look great and I love that you can do them in the instant pot! Will definitely be giving these a try! I'm all for doing whatever it takes to reduce or eliminate the effects of beans on the digestive system. . .especially where the hubby is concerned. And such a great idea to prepare them in the Instant Pot to eliminate boil over. I was just making a syrup on my stove top. . .and let's just say we are still trying to get used to each other. Well, that syrup boiled over and made one huge mess. Not fun! LOL - I always wonder when I say that what people will think... I've seen many directions that either assure you that you can skip the soak (and many people can) or faithfully recommend it (with no clue why.) I like to know why I take extra steps - and I have found this one makes a difference. And oh, dear... Yes, I'm still getting used to the stove in the new house as well - I have used electric stoves before, but I'm not fond of them. I hope you figure yours out soon! I love that you can cook beans so quickly in the pressure cooker. What a game changer! Yum. 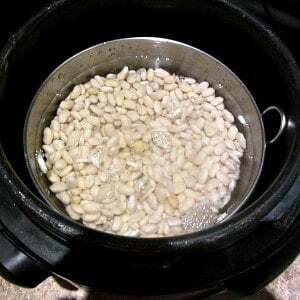 I love cooking beans in my instant pot!! Very fun and quick!! I can't wait to try your recipe! I love Northern beans! Save so much time, doesn't it? Enjoy! Any excuse to use my instant pot! I love beans and I can think of so many amazing dishes they can be part of. Can't wait to try your recipe! May as well get the most use out of the thing, right? Enjoy! The bowl in bowl does help with foaming, if that's ever been an issue. Hmmm... done that in a slow cooker, but not the pressure cooker. I'm not sure it would fit, to be honest - but I"ll have to see! Thanks for reminding me. Often what I do, though, is just cook that in the slow cooker for the stock - and then use that in the recipes when I use the cooked beans. I have often wanted to cook dry garbanzo beans before making hummus and I end up skipping it and just using the canned variety to save time. I will try your technique next for hummus! Thanks! LOL - same here! I always have canned on hand, because there are just days... but I'm using them less often, now. Hope you like it, and thank you! Yum! I love beans - and the fact that they can be cooked so easily is awesome! I will use this next time instead of using canned beans! It really makes a difference! I love it when I can cook something that takes no attention from me. I just got my instant pot this week and I can't wait to try this recipe! I love beans and these look delicious! Oh, perfect! When I got the pressure cooker, I have to admit it sat around for a long time while I figured out what I wanted to do with it - but now I use it regularly. Hope you like this method as much as I do. Well, I still don't have an insta-pot. I used to have two pressure cookers -- really old and gave them away. The only thing I did with them was to can veggies and soups. And it must be wonderful to be able to cook the beans in just no time. I'd buy the dry beans more often if I had an insta pot. I had a stovetop one many years ago, and really almost never used it - it took too much fuss. Yes, it was fast, but I seemed to have to totally concentrate on it - and I needed to fix the rest of the meal! The electric pressure cooker (mine isn't an Instant Pot but they do the same things and more, I understand) is a whole other story, though. I don't have to pay any attention to it at all! This is such a time reducing method! We love beans and, as most, we are very busy and that is great to know!